Play-Doh (1994–2014). From the Bill Bell Collection, courtesy of the Whitney Museum of American Art. Copyright Jeff Koons 2014. I have invited menswear blogger David Isle to write a guest post on the Jeff Koons show at the Whitney. If you have heard of just one menswear blogger, it probably isn’t him. But you can find his blog here and follow him on Twitter here. Enjoy! I read recently that some vanishingly small percentage of Americans could name a living painter. Like any educated coast-dweller, I launched into the well-practiced scoff I reserve for the American public’s many feats of stupidity, such as the 18 percent of Americans who believe the sun revolves around the earth, the 43 percent of Americans who believe in creationism, or the 47 percent of American voters who chose Romney in 2012. Just as I was about to decry the lack of funding for art programs in schools, I realized that I couldn’t name a living painter either. Unless you count my ex-girlfriend, who for a brief time tried selling some paintings on e-Bay under a fake name and art degree. (She gave up after a run of single-digit hammer prices. I am still disappointed that the Internet failed to recognize her genius, and diligently cherish the few pieces of her work I have, which will surely be priceless someday). So that should give you some idea of how unqualified I am to judge the works of an actual living artist such as Jeff Koons, whom I have now heard of, having seen his retrospective at the Whitney museum earlier this month. While I am happy to call Koons an artist (the “what is art” debate carries absolutely no interest for me), and even a painter (although at least according to this video, he doesn’t actually paint anything anymore), I find it more interesting to think of him as a brand. He might squirm at that conception of his enterprise. His early (and, in my opinion, best) work memorialized the fetishization of newness and image that brands promote: shiny-new vacuum cleaners which must have looked modernistic when they were made 35 years ago; the Luxury and Degradation series, which magnifies liquor ads and inspects them for poor taste. 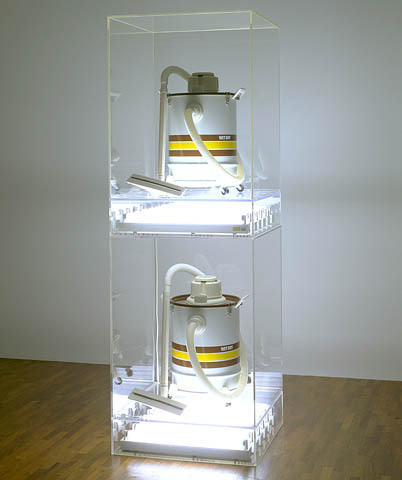 Like the most successful brands, Koons has established a distinctive “look” that makes his pieces readily identifiable. A Koons product is big, it is gaudy, and, by virtue of the first two qualities and the Koons authorship, it is expensive. Very expensive. Koons’s Balloon Dog (Orange) sold at auction for $58.4 million, the highest price ever for a work sold at auction by a living artist. The typical piece is oversized kitsch with a glossy finish. It could be a plastic animal; it could be a figurine you might find at a church gift shop; it could be a picture of Koons ejaculating on his pornstar ex-wife (true story). Towards what purpose? The blurb next to a shiny statue of Bob Hope tells us that “by transforming his lowbrow readymades into highbrow art and making his historical sources more contemporary, Koons achieves a kind of democratic leveling of culture.” I question how highbrow the art really is (“highbrow” is one of those terms, like “fornication,” that is mostly used by people who have only an imagined relationship with the concept in question), although the Whitney may actually believe that any art becomes highbrow by virtue of its being shown at the Whitney. But leaving that aside, Koons achieves a democratic leveling of culture by selling balloon dogs for $60 mil like Dolce and Gabbana achieves democratic leveling of fashion by selling $900 track pants. Much like the world’s most expensive clothing brands, Koons and his PR team take great pains to describe all the demanding feats of engineering that are required to faithfully reproduce gewgaws from the dollar store at a thousand times their original size. For instance, the product description for one painting tells us that the canvas has been “hand-painted” by actual New York artists. But you don’t shell out millions of dollars for a Koons piece for the production value. I’d imagine you buy one because you have huge amounts of space to fill in your vast estate, and don’t want any of your visitors to miss the fact that you’re a collector of (possibly highbrow) art. Whether it’s the artist’s intent or not, oversized, shiny, recognizable artwork serves as a perfect status-signaling vehicle for rich guys, just as new vacuum cleaners serve the same purpose for the heavily solicited middle class. The record-setting Balloon Dog was owned by Peter Brant, childhood friend of suspected philistine Donald Trump. He has exhibited sculptures at the Palace of Versailles, which is so grossly over-opulent that the poor peasants on whose backs the place was built decided to decapitate everyone involved. Koons even designed a yacht for one of his best customers. Koons has said that his artwork “is a support system for people to feel good about themselves.” I believe this, but I doubt that the people whose self-regard he supports are the “underdogs” that he imagines. And yet here we are, gawking at this spectacle for the last five months of the Whitney’s stay at its current 75th Street location. If you polled all of the Americans who could name exactly one living artist, Koons might be the most often nominated. (I actually Googled “living painters” so that I could exclude myself from this group. Once Gerhard Richter kicks the bucket I guess I will have to get on Google again.) So if Koons is the only artist you’ve heard of, this show is for you. If you have voyeuristically wondered what goes inside the homes of the extravagantly wealthy but haven’t been able to swing the invite, this show is for you. If you know nothing about modern art but want to write a thousand words on it anyway, this show is for you, too. You’ve got until October 19th.